Definition at line 673 of file APFloat.h. Definition at line 835 of file APFloat.h. Definition at line 4441 of file APFloat.cpp. Definition at line 837 of file APFloat.h. Definition at line 839 of file APFloat.h. Definition at line 841 of file APFloat.h. Definition at line 842 of file APFloat.h. Definition at line 843 of file APFloat.h. Definition at line 940 of file APFloat.h. References assert(), getSemantics(), and llvm_unreachable. Referenced by llvm::ConstantFoldBinaryInstruction(), llvm::SelectionDAG::foldConstantFPMath(), llvm::ExecutionEngine::getConstantValue(), getSqrtCall(), llvm::detail::DoubleAPFloat::multiply(), operator+(), and llvm::detail::DoubleAPFloat::operator=(). Definition at line 1093 of file APFloat.h. Referenced by llvm::DwarfUnit::addConstantFPValue(), llvm::SparcTargetLowering::bitcastConstantFPToInt(), buildEXP(), llvm::canConstantFoldCallTo(), CC_MipsO32_FP64(), changeFCMPPredToAArch64CC(), llvm::FunctionComparator::cmpAPFloats(), ConvertDoubleToBytes(), llvm::detail::DoubleAPFloat::convertFromAPInt(), llvm::detail::DoubleAPFloat::convertFromSignExtendedInteger(), llvm::detail::DoubleAPFloat::convertFromString(), llvm::detail::DoubleAPFloat::convertFromZeroExtendedInteger(), llvm::detail::DoubleAPFloat::divide(), emitDebugLocValue(), emitGlobalConstantFP(), llvm::R600TargetLowering::EmitInstrWithCustomInserter(), llvm::detail::DoubleAPFloat::fusedMultiplyAdd(), llvm::ExecutionEngine::getConstantValue(), llvm::detail::DoubleAPFloat::getExactInverse(), llvm::AArch64_AM::getFP16Imm(), llvm::ARM_AM::getFP16Imm(), llvm::AArch64_AM::getFP32Imm(), llvm::ARM_AM::getFP32Imm(), llvm::AArch64_AM::getFP64Imm(), llvm::ARM_AM::getFP64Imm(), GetFPLibCall(), getImplicitScaleFactor(), llvm::SelectionDAG::getNode(), getOpenCLAlignment(), GetPromotionOpcode(), getSplatConstantFP(), llvm::HexagonLowerToMC(), llvm::SITargetLowering::isCanonicalized(), llvm::AArch64TargetLowering::isFPImmLegal(), llvm::ARMLegalizerInfo::legalizeCustom(), llvm::HexagonTargetLowering::LowerBITCAST(), llvm::detail::DoubleAPFloat::mod(), llvm::detail::DoubleAPFloat::next(), nextReg(), parseHexOcta(), llvm::R600TargetLowering::PerformDAGCombine(), llvm::NVPTXFloatMCExpr::printImpl(), Profile(), llvm::detail::DoubleAPFloat::remainder(), llvm::detail::DoubleAPFloat::roundToIntegral(), llvm::HexagonDAGToDAGISel::SelectConstantFP(), ShrinkLoadReplaceStoreWithStore(), llvm::SystemZVectorConstantInfo::SystemZVectorConstantInfo(), toString(), and WriteConstantInternal(). Definition at line 1111 of file APFloat.h. Referenced by llvm::DenseMapAPFloatKeyInfo::isEqual(), llvm::X86TargetLowering::isFPImmLegal(), isInv2Pi(), and toString(). Definition at line 1049 of file APFloat.h. Referenced by buildMultiplyTree(), changeSign(), EmitAddTreeOfValues(), FoldIntToFPToInt(), GetNegatedExpression(), llvm::SelectionDAG::getNode(), INITIALIZE_PASS(), matchSVEPredicateVectorRegName(), llvm::detail::DoubleAPFloat::multiply(), llvm::neg(), llvm::detail::DoubleAPFloat::operator=(), parseHexOcta(), and llvm::X86TargetLowering::X86TargetLowering(). Definition at line 1050 of file APFloat.h. Referenced by llvm::abs(), llvm::SelectionDAG::getNode(), LowerFCOPYSIGN(), and llvm::InstCombiner::visitFCmpInst(). Definition at line 1101 of file APFloat.h. Referenced by llvm::ConstantFoldCompareInstruction(), EmitAddTreeOfValues(), fmed3AMDGCN(), getMad64_32(), llvm::MDNode::getMostGenericFPMath(), getSplatConstantFP(), getSqrtCall(), llvm::isMathLibCallNoop(), mapBinOpcode(), matchFastFloatClamp(), llvm::maximum(), llvm::maxnum(), llvm::minimum(), llvm::minnum(), llvm::InstCombiner::visitFCmpInst(), and llvm::InstCombiner::visitICmpInst(). Definition at line 4446 of file APFloat.cpp. References assert(), llvm::detail::IEEEFloat::convert(), getSemantics(), llvm_unreachable, llvm::APFloatBase::opOK, and llvm::MipsISD::Ret. Referenced by llvm::canConstantFoldCallTo(), llvm::ConstantFoldCastInstruction(), emitDebugValueComment(), fitsInFPType(), llvm::SelectionDAG::foldConstantFPMath(), FunctionNumber(), llvm::ConstantFP::get(), llvm::getAPFloatFromSize(), llvm::SelectionDAG::getConstantFP(), llvm::SelectionDAG::getNode(), getOpenCLAlignment(), getPow(), getSqrtCall(), llvm::ConstantFP::isExactlyValue(), isExactlyValue(), llvm::ConstantFP::isValueValidForType(), LLVMConstRealGetDouble(), llvm::ARMAsmPrinter::lowerOperand(), lowerUINT_TO_FP_vec(), llvm::NVPTXFloatMCExpr::printImpl(), valueHasFloatPrecision(), llvm::InstCombiner::visitCallInst(), llvm::InstCombiner::visitFCmpInst(), llvm::LegalizerHelper::widenScalar(), WriteConstantInternal(), and llvm::X86TargetLowering::X86TargetLowering(). Definition at line 1076 of file APFloat.h. Referenced by llvm::ConstantFoldCastInstruction(), llvm::detail::DoubleAPFloat::convertFromAPInt(), llvm::ExecutionEngine::getConstantValue(), llvm::SelectionDAG::getNode(), and llvm::InstCombiner::visitICmpInst(). Definition at line 1080 of file APFloat.h. Definition at line 4429 of file APFloat.cpp. Referenced by APFloat(), llvm::detail::DoubleAPFloat::convertFromString(), llvm::StringRef::getAsDouble(), matchSVEPredicateVectorRegName(), and parseHexOcta(). Definition at line 1086 of file APFloat.h. Definition at line 1096 of file APFloat.h. Referenced by llvm::canConstantFoldCallTo(), ConvertDoubleToBytes(), emitDebugValueComment(), llvm::StringRef::getAsDouble(), getSqrtCall(), LLVMConstRealGetDouble(), llvm::log2(), llvm::WebAssemblyMCInstLower::lower(), llvm::ARMAsmPrinter::lowerOperand(), and WriteConstantInternal(). Definition at line 1097 of file APFloat.h. Referenced by llvm::canConstantFoldCallTo(), ConvertDoubleToBytes(), emitDebugValueComment(), llvm::FPMathOperator::getFPAccuracy(), LLVMConstRealGetDouble(), llvm::log2(), llvm::WebAssemblyMCInstLower::lower(), llvm::R600TargetLowering::PerformDAGCombine(), and WriteConstantInternal(). Definition at line 1136 of file APFloat.h. Definition at line 1068 of file APFloat.h. Referenced by llvm::canConstantFoldCallTo(), llvm::ConstantFoldCastInstruction(), convertToInteger(), ConvertToSInt(), llvm::BuildVectorSDNode::getConstantFPSplatPow2ToLog2Int(), llvm::ExecutionEngine::getConstantValue(), llvm::SelectionDAG::getNode(), getPow(), llvm::FastISel::getRegForValue(), tryBitfieldInsertOpFromOr(), and llvm::InstCombiner::visitICmpInst(). Definition at line 4511 of file APFloat.cpp. References convertToInteger(), llvm::APInt::getBitWidth(), llvm::APInt::getNumWords(), llvm::APSInt::isSigned(), and llvm::sys::fs::status(). Definition at line 1054 of file APFloat.h. Referenced by llvm::canConstantFoldCallTo(), copySign(), and llvm::SelectionDAG::foldConstantFPMath(). A static helper to produce a copy of an APFloat value with its sign copied from some other APFloat. Definition at line 1061 of file APFloat.h. Definition at line 967 of file APFloat.h. Referenced by llvm::ConstantFoldBinaryInstruction(), llvm::detail::DoubleAPFloat::divide(), llvm::SelectionDAG::foldConstantFPMath(), llvm::ExecutionEngine::getConstantValue(), operator/(), and llvm::InstCombiner::visitCallInst(). Definition at line 4500 of file APFloat.cpp. Definition at line 994 of file APFloat.h. Referenced by llvm::canConstantFoldCallTo(), llvm::detail::DoubleAPFloat::fusedMultiplyAdd(), llvm::SelectionDAG::getNode(), and llvm::detail::DoubleAPFloat::multiply(). Definition at line 4471 of file APFloat.cpp. References assert(), llvm::APInt::getAllOnesValue(), and llvm_unreachable. Referenced by llvm::Constant::getAllOnesValue(), and lowerShuffleAsBitMask(). Definition at line 1153 of file APFloat.h. Definition at line 1175 of file APFloat.h. References APFLOAT_DISPATCH_ON_SEMANTICS, Arg, and llvm::hash_value(). Negative True iff the number should be negative. Definition at line 863 of file APFloat.h. Referenced by llvm::ConstantFP::getInfinity(), and parseHexOcta(). Definition at line 903 of file APFloat.h. Referenced by llvm::fuzzerop::makeConstantsWithType(), parseTexFail(), and llvm::InstCombiner::visitICmpInst(). Negative - True iff the NaN generated should be negative. payload - The unspecified fill bits for creating the NaN, 0 by default. The value is truncated as necessary. Definition at line 874 of file APFloat.h. Referenced by llvm::SelectionDAG::foldConstantFPMath(), llvm::ConstantFP::getNaN(), and parseHexOcta(). Definition at line 885 of file APFloat.h. Referenced by llvm::ConstantFP::getQNaN(), llvm::SITargetLowering::isCanonicalized(), toString(), and vectorEltWillFoldAway(). Definition at line 1154 of file APFloat.h. Referenced by add(), bitwiseIsEqual(), llvm::MachineIRBuilder::buildFConstant(), llvm::FunctionComparator::cmpAPFloats(), compare(), convert(), divide(), llvm::frexp(), FunctionNumber(), fusedMultiplyAdd(), llvm::ConstantFP::get(), llvm::ConstantFP::getInfinity(), getMad64_32(), getParentPad(), getPow(), getSqrtCall(), llvm::hash_value(), llvm::SITargetLowering::isCanonicalized(), isContractable(), llvm::ConstantFP::isExactlyValue(), llvm::isMathLibCallNoop(), llvm::ConstantFP::isValueValidForType(), matchPair(), mod(), multiply(), llvm::AMDGPUTargetLowering::performRcpCombine(), remainder(), llvm::scalbn(), subtract(), llvm::SystemZVectorConstantInfo::SystemZVectorConstantInfo(), toString(), llvm::InstCombiner::visitCallInst(), llvm::InstCombiner::visitICmpInst(), and WriteConstantInternal(). Might be denormalized, which implies a relative loss of precision. Definition at line 913 of file APFloat.h. Definition at line 923 of file APFloat.h. Referenced by INITIALIZE_PASS(), scalarizeBinOpOfBuildVectors(), and llvm::InstCombiner::visitFCmpInst(). Definition at line 893 of file APFloat.h. Definition at line 854 of file APFloat.h. Referenced by llvm::ExecutionEngine::getConstantValue(), getMad64_32(), llvm::ConstantFP::getNegativeZero(), llvm::Constant::getNullValue(), llvm::fuzzerop::makeConstantsWithType(), and llvm::X86TargetLowering::X86TargetLowering(). Definition at line 1147 of file APFloat.h. Referenced by llvm::SITargetLowering::isCanonicalized(), isDenormal(), and llvm::InstCombiner::visitCallInst(). We don't rely on operator== working on double values, as it returns true for things that are clearly not equal, like -0.0 and 0.0. As such, this method can be used to do an exact bit-for-bit comparison of two floating point values. We leave the version with the double argument here because it's just so convenient to write "2.0" and the like. Without this function we'd have to duplicate its logic everywhere it's called. Definition at line 1129 of file APFloat.h. Referenced by CanCombineFCOPYSIGN_EXTEND_ROUND(), changeFCMPPredToAArch64CC(), getSqrtCall(), llvm::ConstantFPSDNode::isExactlyValue(), and llvm::SelectionDAG::simplifyFPBinop(). Definition at line 1151 of file APFloat.h. 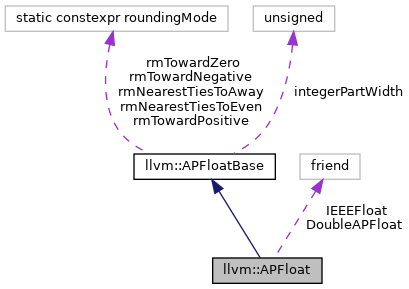 Referenced by mapBinOpcode(), matchFastFloatClamp(), llvm::detail::DoubleAPFloat::multiply(), and llvm::detail::DoubleAPFloat::operator=(). Definition at line 1156 of file APFloat.h. Referenced by getParentPad(), and llvm::detail::DoubleAPFloat::multiply(). Definition at line 1143 of file APFloat.h. Referenced by getMad64_32(), llvm::ConstantFP::isInfinity(), llvm::isMathLibCallNoop(), llvm::detail::DoubleAPFloat::operator=(), simplifyBinaryIntrinsic(), SimplifyFCmpInst(), llvm::InstCombiner::visitCallInst(), and WriteConstantInternal(). Definition at line 1161 of file APFloat.h. Referenced by getPow(), getSqrtCall(), and isInteger(). Definition at line 1160 of file APFloat.h. Definition at line 1144 of file APFloat.h. Referenced by llvm::SITargetLowering::isCanonicalized(), llvm::isMathLibCallNoop(), llvm::ConstantFP::isNaN(), llvm::PatternMatch::is_nan::isValue(), llvm::maximum(), llvm::maxnum(), llvm::minimum(), llvm::minnum(), SimplifyFCmpInst(), toString(), llvm::InstCombiner::visitCallInst(), llvm::InstCombiner::visitICmpInst(), and WriteConstantInternal(). Definition at line 1146 of file APFloat.h. Referenced by CanCombineFCOPYSIGN_EXTEND_ROUND(), copySign(), foldFCmpReciprocalAndZero(), getMad64_32(), getParentPad(), getSqrtCall(), llvm::isMathLibCallNoop(), llvm::ConstantFP::isNegative(), mapBinOpcode(), llvm::maximum(), llvm::minimum(), simplifyBinaryIntrinsic(), SimplifyFCmpInst(), llvm::InstCombiner::visitCallInst(), and llvm::InstCombiner::visitICmpInst(). Definition at line 1158 of file APFloat.h. Referenced by llvm::MipsTargetLowering::getTypeForExtReturn(), llvm::SystemZTargetLowering::isFPImmLegal(), llvm::PatternMatch::is_neg_zero_fp::isValue(), SimplifyFCmpInst(), and llvm::SelectionDAG::simplifyFPBinop(). Definition at line 1155 of file APFloat.h. Definition at line 1150 of file APFloat.h. Referenced by factorizeFAddFSub(), and llvm::InstCombiner::visitCallInst(). Definition at line 1157 of file APFloat.h. Referenced by llvm::AArch64TargetLowering::isFPImmLegal(), llvm::PPCTargetLowering::isFPImmLegal(), llvm::PatternMatch::is_pos_zero_fp::isValue(), matchSVEPredicateVectorRegName(), and llvm::SelectionDAG::simplifyFPBinop(). Definition at line 1148 of file APFloat.h. Referenced by llvm::SITargetLowering::isCanonicalized(), and llvm::InstCombiner::visitCallInst(). Definition at line 1159 of file APFloat.h. Definition at line 1142 of file APFloat.h. Referenced by foldFCmpReciprocalAndZero(), llvm::MipsTargetLowering::getTypeForExtReturn(), llvm::SystemZTargetLowering::isFPImmLegal(), llvm::isMathLibCallNoop(), llvm::PatternMatch::is_any_zero_fp::isValue(), llvm::ConstantFP::isZero(), mapBinOpcode(), llvm::maximum(), llvm::minimum(), llvm::InstCombiner::visitCallInst(), llvm::InstCombiner::visitFCmpInst(), and llvm::InstCombiner::visitICmpInst(). Definition at line 985 of file APFloat.h. Referenced by llvm::ConstantFoldBinaryInstruction(), llvm::SelectionDAG::foldConstantFPMath(), llvm::ExecutionEngine::getConstantValue(), and llvm::detail::DoubleAPFloat::mod(). Definition at line 958 of file APFloat.h. Referenced by llvm::ConstantFoldBinaryInstruction(), llvm::SelectionDAG::foldConstantFPMath(), llvm::ExecutionEngine::getConstantValue(), llvm::detail::DoubleAPFloat::multiply(), and operator*(). Definition at line 849 of file APFloat.h. Definition at line 1013 of file APFloat.h. Definition at line 1035 of file APFloat.h. Definition at line 1019 of file APFloat.h. Definition at line 1027 of file APFloat.h. Definition at line 1043 of file APFloat.h. Definition at line 4493 of file APFloat.cpp. Definition at line 4503 of file APFloat.cpp. Definition at line 976 of file APFloat.h. Definition at line 1007 of file APFloat.h. Referenced by llvm::canConstantFoldCallTo(), llvm::SelectionDAG::getNode(), mapBinOpcode(), llvm::detail::DoubleAPFloat::roundToIntegral(), and llvm::InstCombiner::visitICmpInst(). Definition at line 949 of file APFloat.h. Referenced by llvm::ConstantFoldBinaryInstruction(), llvm::SelectionDAG::foldConstantFPMath(), llvm::ExecutionEngine::getConstantValue(), llvm::detail::DoubleAPFloat::multiply(), operator-(), and llvm::detail::DoubleAPFloat::operator=(). Definition at line 1166 of file APFloat.h. References APFLOAT_DISPATCH_ON_SEMANTICS, llvm::dump(), print(), and llvm::toString(). Referenced by emitGlobalConstantFP(), print(), printConstant(), toStringAPFloat(), and WriteConstantInternal(). These additional declarations are required in order to compile LLVM with IBM xlC compiler. Definition at line 4433 of file APFloat.cpp. Definition at line 1180 of file APFloat.h. Definition at line 1184 of file APFloat.h. Definition at line 1183 of file APFloat.h.